It seems as if anytime movie fans get together and talk about great gangster/crime movies they’ll mention “The Godfather Trilogy” “Scarface” “Bonnie & Clyde” ”The Untouchables” “Once Upon A Time In America” “Goodfellas” or “Miller’s Crossing” just to name some of my own favorites off the top of my head but nobody ever seems to mention THE COTTON CLUB which is kinda surprising considering that it was directed by Francis Ford Coppola who directed “The Godfather Trilogy” and shouldn’t be looked down upon as a lesser work of that great director. 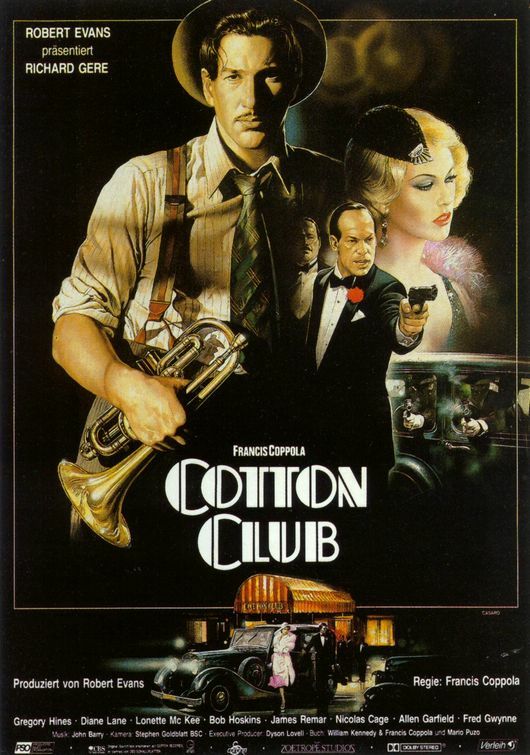 I’m not for a moment suggesting that THE COTTON CLUB is equal to “The Godfather Trilogy” but what I am saying is that THE COTTON CLUB seems to get overlooked whenever gangster/crime movie favorites are mentioned and it shouldn’t. It’s an incredibly entertaining movie on a lot of levels and explores an era of American history I’ve always been fascinated with and it’s packed full of terrific actors who all turn in outstanding performances. The movie begins in 1928; the height of the jazz era and The Cotton Club is the hottest nightclub in New York City. Bootleggers and gangsters rub elbows with the big rich and movie stars as they are entertained by the top black entertainers of the day such as Cab Calloway and Duke Ellington. It’s not unusual to see Fanny Brice and Jimmy Cagney sitting at the same table with Lucky Luciano and Owney Madden, so intertwined are the worlds of organized crime and entertainment. Everybody’s a celebrity whether they deal in box office or bullets. We’re introduced to Dixie Dwyer (Richard Gere), a cornet player who has the misfortune to save the life of the infamous Dutch Schultz (James Remar) from a thrown bomb one night. It’s misfortunate because The Dutchman takes a liking to Dixie and being on the good side of a bloodthirsty psychopath like Dutch is almost as dangerous as being on his bad side. The situation gets complicated when Dixie falls in love with Dutch’s mistress Vera Cicero (Diane Lane) and Vera falls in love right back. Dixie gets even more involved with Dutch’s criminal organization due to his brother Vincent (Nicholas Cage) going to work for Dutch when The Dutchman incites a vicious and bloody war as he sets out to take over the Harlem numbers rackets. Intertwined is the story of Sandman Williams (Gregory Hines), a tap dancer who is in love with Lila Oliver (Lonette McKee), a torch singer who can pass for white and does so as a way of escaping the intolerable racism of The Cotton Club where black audiences can’t get in to see black performers and Sandman is beaten up by the stage manager just for wanting to talk to her in private. While the love story of these two couples is played out there’s other stories swirling around them: Vincent becomes increasingly unhappy with getting shot up doing The Dutchman’s dirty work and plans to make his own move and get a bigger slice of the lucrative Harlem rackets. Sandman and his brother Clay have a falling out and they break up their act. Owney Madden (Bob Hoskins) realizes that the Italian/Sicilian mobs are making a big push into New York, squeezing out the Irish and Jewish gangsters and he thinks that maybe retirement isn’t looking so bad. Dutch is getting increasingly crazier and crazier and the streets of Harlem are running red as he refuses to back down in his psychotic desire to take it from the control the black gangsters. Dixie realizes that between his growing love for Vera and his disgust for Dutch his chances of staying healthy aren’t very good. There are a lot of different stories going on but the movie never seems like its rushing or skimping on the characters and their fates. The movie is a little over two hours long and none of the running time is wasted. There’s never a slow point in the movie. There are so many characters and so much story that Coppola can’t afford to waste any time. Part of the reason the movie is so entertaining is the excellent casting. Richard Gere and Gregory Hines are both good looking leading men and they’re wonderful here. Richard Gere is billed as doing his own cornet solos and I dunno if that’s true or not but he certainly looks as if he knows what he’s doing. And Gregory Hines is simply brilliant when he’s tap dancing and that’s his real life brother who plays his brother in the movie. Supposedly the story of the Williams brothers is based on a lot of what happened to the Hines brothers in their own career. Diane Lane and Lonette McKee are appropriately gorgeous leading women and it doesn’t hurt that they both know how to act very well. But my favorite actors in the movie are Bob Hoskins and Fred Gwynne, who plays Frenchie, the bodyguard/confidant/partner of Owney Madden. They’re based on real life gangsters of the era and I have no idea if they were as interesting in real life as they are in this movie but they shoulda been. They make an odd pair, Madden squat and solid as a fireplug, possessing a culture and charm that masks his dangerous soul and Frenchie, a towering giant with a graveyard voice and deep set eyes. The two of them are fiercely loyal and protective of each other and it’s demonstrated in a scene where Frenchie is kidnapped and Madden gladly pays the ransom. Frenchie turns up alive and well and Madden is almost hysterical with worry as Frenchie calmly explains how he passed the time with his kidnappers. Hoskins and Gwynne effortlessly steal the movie with that scene which ends up as something real and honestly touching. What else is good in the movie? Well, there’s Gwen Verdon who plays Dixie’s mother and Mario Van Peebles is one of The Cotton Club dancers. Laurence Fishburne plays a character based on the great black gangster Bumpy Johnson, a character he would play again in “Hoodlum”. The period costumes and sets look wonderful and the music and dancing work to give you an excellent idea of what that era must have been like. And despite a couple of grisly deaths somehow Coppola manages to pull a happy ending out of all the bloody misery that doesn’t seem forced but has the same feeling of inevitability that his “Godfather” films do. So should you see THE COTTON CLUB? I have no idea why you wouldn’t want to. It’s an excellent gangster movie made by a director who knows this material like a monkey knows coconuts and it’s an extremely well made period piece with plenty of great music and not a bad performance from any of the actors and how many movies have you ever heard me say that about? Spot on–especially about Bob and Fred. They stole this movie from Gere and Remar–who has the worst luck of getting upstaged in every movie he should’ve been the star of. Agreed. In any other movie, Remar’s performance would have stolen the movie. But he’s up against so many wonderful actors who are ALL on their A-game that he doesn’t stand a chance. And the Owney Madden/Frenchie characters are so distinctive and interesting that Coppola could easily have done a sequel to this just about them. It’s been a while since i watched it, but was Bumpy Johnson the guy Frank Lucas was chauffeur to in American Gangster?